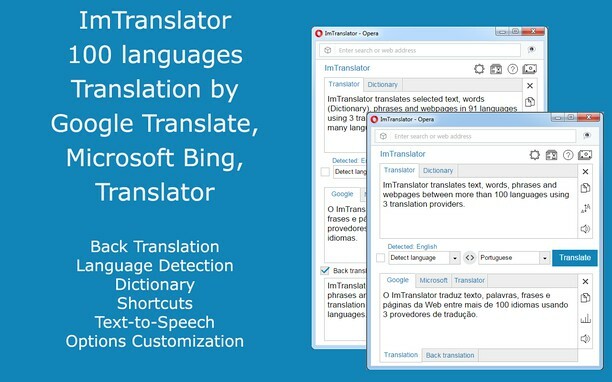 ImTranslator translates selected text (5,000 characters), words (Dictionary), phrases and webpages in 91 languages using 3 translation providers, and reads the text in many languages. * click the floating button to run Pop-up Bubble Translator. 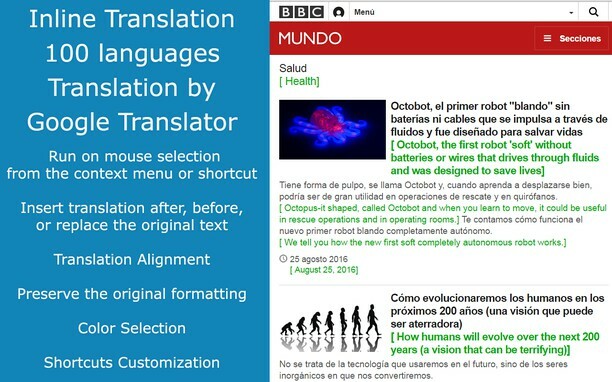 Inline Translator translates selected text sentence-by-sentence, and inserts the translation into the webpage preserving the original formatting. * Inline translator can be run on mouse selection from the context menu, or shortcut. * Insert translation after or before the selected text. * Translation can replace the original text. * Preserve the original page formatting. * Display translation in brackets or without. * Align translation for better visibility by using the line break option. * Control of the text selection by observing the word boundaries. * Select color of the translated text. * Clear inserted translation and restore original page formatting. * Auto language detection of the source text. * Words translation using the built-in dictionary. ImTranslator Options provide a perfect way to customize ImTranslator, Inline Translator, Pop-up Bubble and Webpage Translation. * Set unique language settings for each translation application. * Set one language settings for all translation applications. * Enable the auto language detection. * Enable Dictionary to translate single words. * Enable the back translation for ImTranslator application. * Choose shortcut to launch translation applications. * Modify the Pop-up Bubble behavior. * Perform translation by selecting the text with the mouse. * Choose the size of the font. * Change appearance of the inline translation. * Enable Translation History to store translation records for each translation tool. * Access Translation History records to search, sort, split by sentences, export and save. Afrikaans, Albanian, Arabic, Armenian, Azerbaijani, Basque, Belarusian, Bengali, Bosnian, Bulgarian, Catalan, Cebuano, Chichewa, Chinese (simplified), Chinese (traditional), Croatian, Czech, Danish, Dutch, English, Estonian, Esperanto, Filipino, Finnish, French, Galician, Georgian, German, Greek, Gujarati, Haitian Creole, Hausa, Hebrew, Hindi, Hmong, Hungarian, Icelandic, Igbo, Indonesian, Irish, Italian, Japanese, Javanese, Kannada, Kazakh, Khmer, Korean, Latin, Latvian, Lithuanian, Macedonian, Malagasy, Malay, Malayalam, Maltese, Maori, Marathi, Mongolian, Myanmar (Burmese), Nepali, Norwegian, Persian, Polish, Portuguese, Punjabi, Romanian, Russian, Serbian, Sesotho, Sinhala, Slovak, Slovenian, Somali, Spanish, Sundanese, Swahili, Swedish, Tajik, Tamil, Telugu, Thai, Turkish, Ukrainian, Urdu, Uzbek, Vietnamese, Welsh, Yiddish, Yoruba, Zulu. يستطيع هذا الملحق الوصول إلى البيانات التي تنسخها وتلصقها. 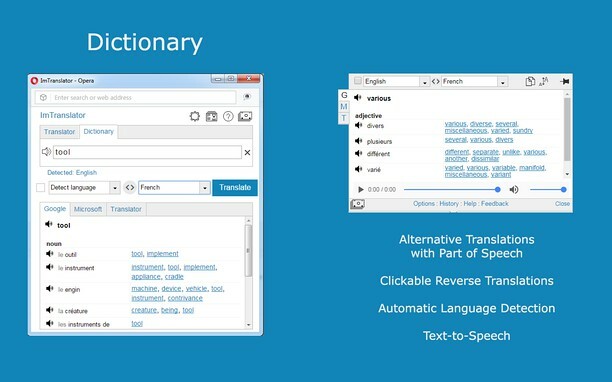 This issue is related to the translation provider that changed the way to access dictionaries resources. To resolve this issue for now, please disable Dictionary in Options by clearing the checkbox net to the "Enable Dictionary" in the translation applications. Remove the checkmark next to "Enable Dictionary" in ImTranslator, Inline Translator, Pop-up Bubble, then Save Options. Klikám na na zelené políčko "+ přidat do Opery" a nic se neděje ! ImTranslator addon does not have voice translation. The language is translated to the the Spanish language without any problem, but there is no voice conversion. In Firefox 39.0 the addon works fine and does the voice conversion as directed. I am trying to convert from Firefox to Opera so there may be problems with my setup. However I have no idea where to correct such a problem. Thanks for any suggestions and help. ImTranslator does have the voice conversion. It's the Speaker icon on the right sidebar that redirects to the TTS page. If you have problems with this, please contact us via the feeback form http://about.imtranslator.net/about/contact-us/ so we can figure out the problem.